Abyssmedia AudioRetoucher is a music transposition tool that changes the pitch and tempo of a sound track in real time. With AudioRetoucher the sound of an instrument or voice might be modified slightly, to make a vocalist or instrumentalist’s job easier in dealing with difficult keys, and usually involves no more than a half-step (semitone) or possibly whole step (whole tone) change. Vocal pitch may also be speeded up to “smooth out” a performance, or to make the singer sound younger. It may be used for special effects like famous Chipmunks recordings were created by recording vocal tracks at a slow speed, then boosting them to normal at playback. 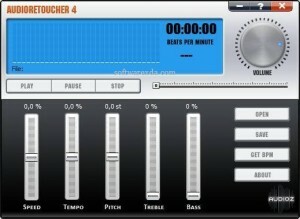 AudioRetoucher mainly used by musicians as MP3 key shifter, but it also can detect BPM values for MP3 files and adjust the tempo in real time. After processing, the tags will be copied to the output file. If necessary, the tags will be converted to the desired format. Do not worry about the Cover Art or the Lyrics – everything will remain in place.